Some pictures of Nokia 9 have been leaked in the media, which clearly shows that this smartphone has five rear cameras. According to media reports, the Penta rear camera will be setup in Nokia 9. Apart from this, there will be LED flash, infrared radiation (IR) and focusing extraction features. The report of The Next Web (TNW) states that five rear lenses have been set up for different jobs. These lenses include telephoto, black and white, color and multi lens pixel synthesis. The internal code name of this smartphone is TA-1094. There are five cameras in the flower pattern in it. The primary camera is set in the middle. Primary rear camera, LED flash and focusing aperture feature is provided around the primary camera. 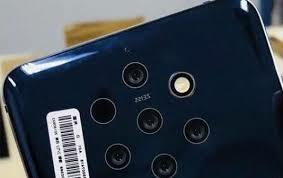 It has also been said in the report that Zeiss has also applied for patents of the cameras of this device. According to the leaked picture, the Nokia 9 used Display Note. This was first reported in some media reports that the Nokia 9 would be a smartphone based on Google's Android One program. In the IFA-2018 held in Berlin in Germany, no information was disclosed by the company for Nokia 9.